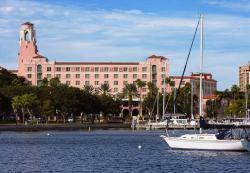 The Road Race Management Race Directors' Meeting will be at the Vinoy Renaissance St. Petersburg Resort and Golf Club in St. Petersburg in 2019. This upscale St. Petersburg, FL hotel is right on the downtown waterfront and near the area's most popular attractions, including the Salvador Dalí Museum, the Morean Arts Center, Tropicana Field and a variety of pristine Florida beaches. Click Here to read about the Vinoy's storied history. Click Here for more information about the Vinoy. Note: the link at left is only for information about the hotel; use the passkey link above to make reservations at the special RRM rate.